Portion size is often people's stumbling block when looking at changing their lifestyle and eating healthier. Knowing what a portion is or how much to eat at each meal time can be a minefield. Portion sizes have dramatically changed over the years, with portions getting bigger and plates getting larger. More and more restaurants serve up higher portions with a mian meal often being at least 3/4 of your daily intake or more in just one sitting. Three tablespoons of breakfast cereal, one slice of bread, half a baked potato, two small boiled potatoes, three tablespoons of boiled pasta, two tablespoons of boiled rice, 115g cooked noodles, half a pitta bread and three small crackers. Aim for *unrefined carbohydrates these are whole grains which will keep you fuller for longer. They contain more fibre and have a better nutritional value. Examples are wholemeal bread, pasta and rice. If you're trying to maintain your weight, it's best to aim for between two and four portions with every meal (to add up to eight to 10 for one day). If you're trying to lose excess weight, only eat about five to eight portions per day, which will mean that the amount you have at each meal will be smaller. And if you decide to include most of your day's quota of starchy foods in one meal, cut down throughout the rest of the day. Try to limit your intake of red and processed meat because they can be high in saturated fat, which can raise your cholesterol and cause heart disease. The milk on your cereal and in your tea all counts. Go for lower-fat cheese and yoghurts, and skimmed or semi-skimmed milk. These contain just as much calcium as full-fat versions. Eating a variety of fruit and vegetables, whether fresh, frozen, canned or dried, can all count towards your 5 A Day, and eating these may help to reduce the risk of heart disease, stoke and some cancers. They are also a great source of vitamins and minerals all of which are important for your health. NB Sources from Bupa and NHS. The portion sizes and numbers in this article are calculated using published guidelines that estimate an average person's nutritional and energy requirements. 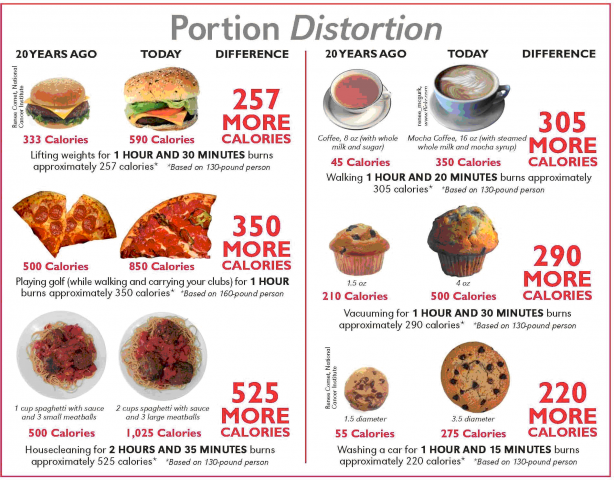 Please speak to your doctor if your are looking at reducing or increasing your calorie intake.